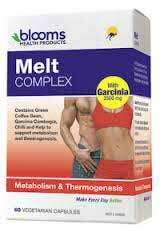 Blooms Melt Complex is a vegetarian and vegan-friendly diet pill manufactured in Sydney by Blooms Health Products. Blooms Melt Complex appears to be designed to function as a fat burner and the low level of stimulants in the formulation could make it a good option for anyone who needs a fat burner, but does not tolerate stimulants well. Fat burning can be encouraged in a number of different ways. Blooms Melt Complex contains a few thermogenic ingredients and an iodine provider to encourage the secretion of extra T-hormones. Thermogenic fat burning ingredients raise the body temperature slightly and cause the body to begin losing calories as heat. 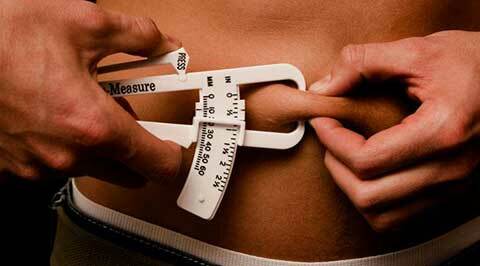 In many cases the calories lost are released from the body’s stores of fat. T-hormones are secreted by the thyroid and help govern the speed of the metabolism. When people’s diets lack sufficient iodine the thyroid may secrete less hormones, causing the metabolism to slow. However, most people do attain enough iodine from their food so supplementation is seldom necessary. Garcinia Cambogia (Brindleberry) extract 250 mg Equivalent to dry fruit 2.5 g (2500 mg) Standardised to hydroxycitric acid (HCA) 125 mg. The way Blooms present the list of ingredients is rather confusing, but green coffee bean extract contains a natural fat burner called chlorogenic acid. If each capsule is providing 90mg of chlorogenic acid it should be an effective dose. Green coffee bean extract is also a source of caffeine, but the amount provided is lower than that of normal roasted coffee beans. Although further study is required capsicum is fast acquiring a reputation as an appetite suppressant. However, capsicum continues to be more highly regarded for its ability to boost he metabolism and encourage thermogenic fat burning. 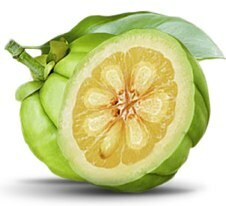 Garcinia cambogia is an Asian fruit. It’s rind provides a fat blocking ingredient called hydroxycitric acid (HCA) that has a good reputation for delivering results and, like capsicum, may also have value as an appetite suppressant. Fucus vesiculosus has been included because it it has a high iodine content but, as already stated earlier in this review, it is unlikely to provide noticeable benefits for any dieter who does not suffer from an iodine deficiency. Usage Instructions – One capsule is required twice per day with a meal and a glass of water. Blooms point out some people may be sensitive to the “warming effects of chilli” and state each capsule contains 4mg of caffeine. A cup of coffee usually provides around 100g of caffeine, so the amount provided here is a very low dose. However, the product is not likely to be suitable for pregnant or nursing mothers. People who have existing health issues should seek the advice of a physician prior to using the product. The same advice applies to people who are using medication. It is not possible to buy Blooms Melt complex from the manufacturer’s website, but the product is stocked by many online stores, including City Health and Pharmacy online. However, at the time of this review (May 2016), most suppliers were either still selling the older version of the product or had forgotten to update their sites to compensate for the changes. The price varies from one supplier to the next, but AUD$ 28 to AUD$ 32 is average for a box of 60 capsules. Blooms Melt Complex does not appear to have the backing of a money back guarantee. Blooms Melt Complex should be able to support weight loss and the chance of side effects is probably pretty low, but it is hard to be certain about any product that has not attained any customer reviews. Undoubtedly the product will offer the most benefit to people who do not obtain enough iodine from their food, but the lack of a money back guarantee means anyone who feels Blooms Melt Complex has not lived up to their expectations will be unable to claim a refund. This is a consideration all potential users need to bear in mind prior to purchasing the product in the hope that it will help them to lose weight. We feel that your money and weight loss hopes are better served elsewhere. We have a refined list of suitable diet products that available to buy either direct or from reputable sources.